We got a pure-bred golden retriever puppy in May and oh man, what a deeee-light our sweet Lucy has been. 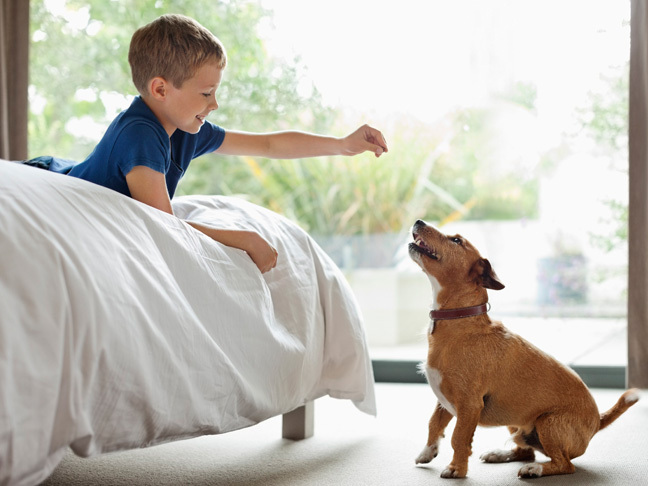 It was great introducing a pet into our home, but I quickly learned I needed to devise a kiddo-puppy training plan to keep everyone happy, having fun, and most importantly safe. Lucy tended to nip and jump and paw and get overly excited. She was just playing but her razor-sharp nips would leave Jack in tears. He’d get frustrated and want to put Lucy in her crate or stop helping with her training, but I couldn’t just separate them—I needed Jack to participate to show our girl who was boss. Here are my tips … and they work. Crate train your puppy. It’s not abusive or evil. Do not think of your puppy’s crate as a cage. Think of it as her bed or home-sweet-home. I took Jack to the pet store with me and we selected a roomy crate for our girl. Back at home, I let Jack choose from the spare comforters and we made her spot extra-cozy. Be sure to use a divider. If the crate is too big, a pup may pee in the back and sleep in the front—big NO-NO. Rule of thumb: Close the door and let your pup sleep, chill, or rest. As soon as you open that door, run your pup out to the grass to pee. Do this every single time. Keep the crate door open even when your pup isn’t inside—she’ll wander off and curl up in there. This is because crates make pups feel safe and secure, not jailed. The crate will also come in handy when your child and pup need a timeout—and they will. Don’t ever use the crate as punishment because you want it to always be a happy, safe place. But don’t be afraid to scoop up puppy and secure her in the crate for a little timeout. I sure have. Make your kid help at (puppy) mealtimes. Our girl eats three small meals a day. There’s a measuring cup in her food bag. Jack loves to fill her bowl and stand on the step stool in the kitchen to fill up her water bowls. Jack also washes her bowls. He takes great pride in this important job and it proves to Lucy that even though Jack is little, he’s her master too and not just a pack-mate she can jump on and use as a chew toy! Tame teething with this fun trick. Ack, ouch, oh no! Puppy mouthing hurts. Both Jack and I have both experienced Lucy’s little needle teeth. Jack takes it hard and thinks she’s biting, but she not. She’s playing. I didn’t want Jack to be scared of his puppy so I needed to find a way for him to feel safe, protected, and able to defend himself without hurting our girl. Our vet recommended a water bottle. Anytime Lucy goes to mouth one of us, we spray her. To make it fun for Jack, I got him a little water gun from the dollar store. The gentle, harmless water gets Lucy’s attention and makes her stop mouthing and nipping. Then I gently grab her mouth, holding it shut and say, firmly: “NO BITING. NO.” You guys, this worked like a charm! Declare your kiddo the pooper scooper. Jack begged and begged for a puppy and when I obliged I told him he would have to help with the not-so-fun duties. Jack is my main pooper-scooper. I taught him how to glove his hand with a plastic baggy and pick up the poop. (Make sure your kiddo uses antibacterial soap as soon as he gets back inside and keep hand sanitizer in your bag for when you’re away from your home.) I love that Jack cleans up after HIS dog. It is really showing him what it means to be responsible. The same goes for bathing. We give Lucy tub baths and Jack loves to lather her up and use a plastic pitcher to rinse her down. And again, because he is actively participating in her care, she knows that he is her master and this helps Lucy to respect him. Schedule vet appointments when your child is free to tag along. We have a great vet, who always welcomes Jack into the exam room. Jack loves to help weigh Lucy and pet her back when she gets her shots. He asks the vet Qs and tells her stories about our girl. The vet explains it’s really important Lucy gets plenty of exercise and doesn’t eat table food. This authoritative voice really speaks to Jack and he loves to share fresh cucumbers from his salad with Lucy, but NEVER pizza or cookies. He holds her leash on walks, suggests trail hikes, and runs Lucy wild at the dog park. Share your puppy training tips!